•	Who is Pearson VUE? Pearson VUE is the global leader in computer-based testing for IT, academic, government and professional programs. In 2011, Pearson VUE delivered over 10 million tests worldwide. A business of Pearson, the company manages the world’s largest, most secure test center network which is comprised of over 5,000 centers in more than 175 countries. Pearson is the world’s leading education company. From pre-school to high school, early learning to professional certification, its curriculum material, multimedia learning tools and testing programs help educate more than 100 million people globally. Pearson’s businesses also include the Financial Times Group, one of the world’s leading business information companies and the world-famous publishers, the Penguin Group. •	For which IT companies does Pearson VUE deliver computer-based tests? Pearson VUE delivers industry-recognized computer-based tests on behalf of some of the world’s leading IT companies. A complete list can be found at http://www.pearsonvue.com/programs/. •	Are computer-based exams considered more credible than pencil and paper-based exams? •	Wouldn’t it be quicker to write rather than type answers? Most candidates use a computer every day, whether at home or at work, and find it quicker to answer questions using CBT. The method also allows them to edit their answers quickly and clearly; thereby reducing ambiguity and allowing for faster exam scoring. •	What if my PC crashes halfway through my exam or there is a power outage in the center? Pearson VUE’s test delivery software will save your responses every 30 seconds, so if there is a power outage your answers can be retrieved. •	How does Pearson VUE ensure test centers are secure and distraction-free? 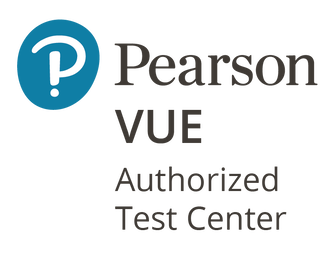 Pearson VUE test centers are proctored environments. The admission process is designed to prevent proxy testing–IDs are checked and the electronic photo and signature of the candidate is captured. Unlike traditional testing environments, Pearson VUE centers are designed to be distraction-free with ample space between candidates – enabling them to better focus on their test. •	Can computer-based IT exams only be taken during certain times of the year? Most exams can be sat on-demand, allowing candidates to test throughout the year at a date and location most convenient to them. •	How long will it take to find out my results? Most candidates receive their results instantly, allowing them to make immediate plans regarding the next stage of their education or career. •	How does Pearson VUE accommodate disabled candidates?